The general assembly of the United Nations is in session again this year. This year Obama is going to give a speech, Putin too, and the Pope as well. We have been preparing psychologically. For the people who live in the neighborhood this inconvenience from the traffic mess may be a special tax we pay to the United Nations. What? 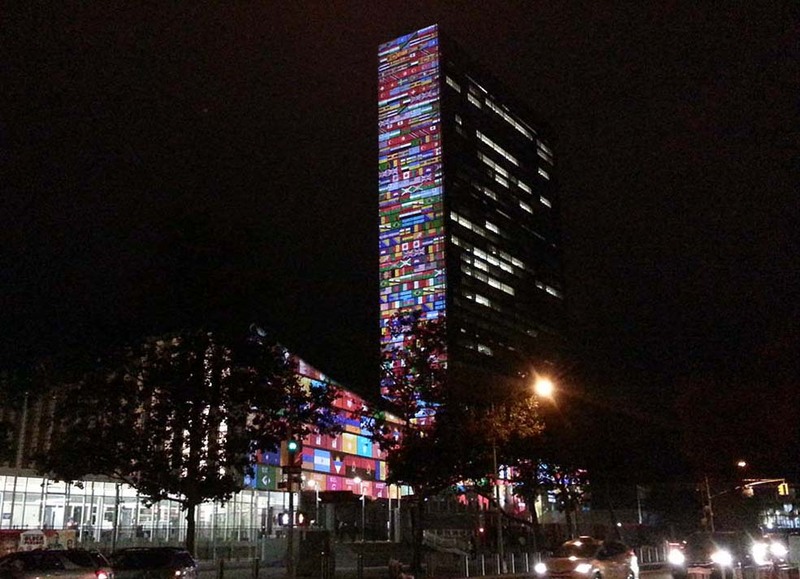 No No, the UN should pay tax to New York City…right? On my way home by bicycle a lot of cars and bikes were blocked from going down the street. A few police motorcycles are standing in the middle of the 7 lanes of traffic on the avenue. It is like a fire is going on there , but no firemen. So I dismounted and started walking the bike. Immediately a policeman yelled at me, with a nasty tone “sir, you can not do that” I ignored it but then he yelled “sirrrr, sirrr! !” good thing is he did not say “Hey you! !” but the tone is exactly the same as “Hey you”. He successfully stopped me. I answered :”many pedestrians are crossing the intersection, what is wrong?” He is getting mad… but he does not know the definition of pedestrian. If you dismount you are pedestrian. Just as a walker with a stroller is a pedestrian, walking a bike you are a pedestrian. It is obvious but his mission in this intense situation and backed by a sense of power- have stopped him from thinking rationally and transformed him into being outrageously aggressive. He must be a nice policeman if he is not in this situation, I can feel it. I asked one of his colleagues who joined this messy conversation “what about this direction?” He answered ” No problem” I looked up at the poor policeman, he shows his chagrin like a hunter who lost its prey. OK I will go in that direction!! while I am regretting not having said goodnight to him, a convoy of black SUV’s passed quietly and showily in front of the waiting people. This must be Putin not Obama as the convoy was not crazy huge. Now on to the main title, there is a something beautiful generated by this messy event. 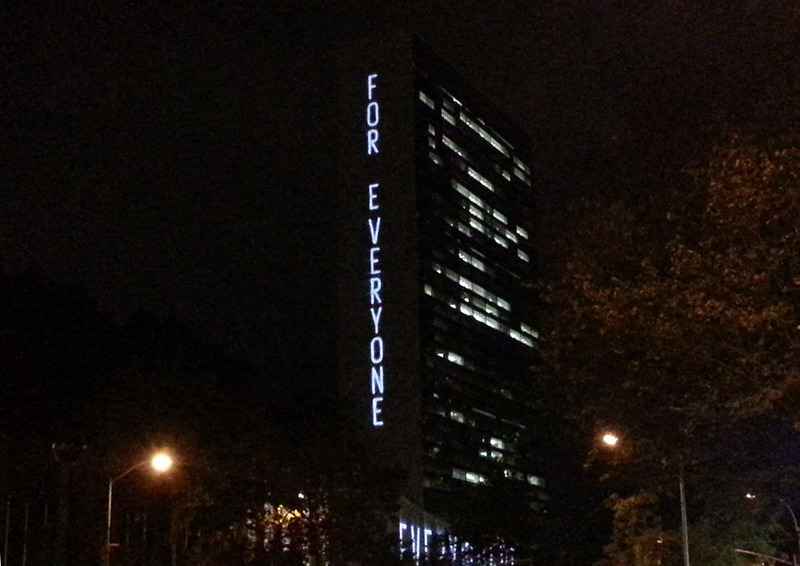 We happened to find a light show projected onto the UN building as we were walking in front of it during the assembly. This year is the 70th year anniversary of the foundation of UN, you know. Although I think just 50 people saw it tonight. It is like our exclusive show. We are so moved partly because of this occasion running into this beautiful thing, but moreover, it shows hope that the world will definitely be better if every country shares these goals. Please take a look at the slide show below which is from the 15 minutes that we watched there.